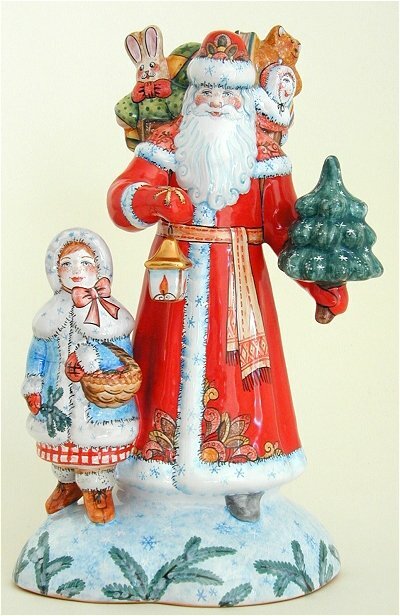 A selection of Christmas themed figurines to decorate your home this Christmas. 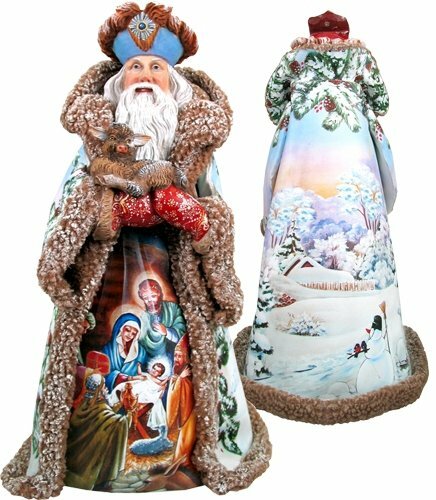 This striking Nativity Santa figure is quite large at 17.5 inches high and wears a canvas cloak with fur trim, satin braids and a velveteen finish. 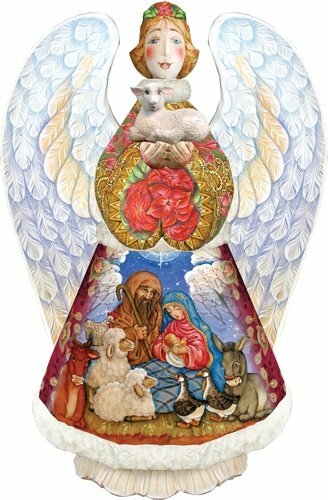 The beautiful Nativity imagery you have come to love on Debreckts wooden Santas is decoupaged to the canvas and then over painted by hand for the look and feel of a fine art piece. Each piece is beautifully packaged in a satin lined box. 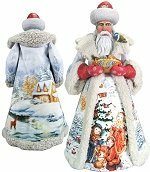 This striking Christmas Santa figure is 17.5 inches high and wears a canvas cloak with white fur trim. 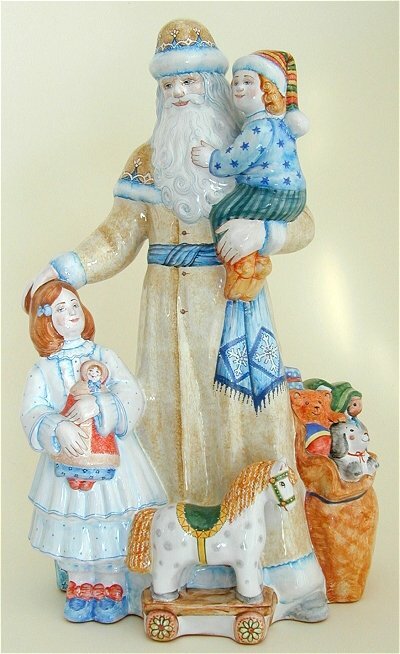 The beautiful Christmas imagery you have come to love on Debreckts wooden Santas is decoupaged to the canvas and then over painted by hand for the look and feel of a fine art piece. 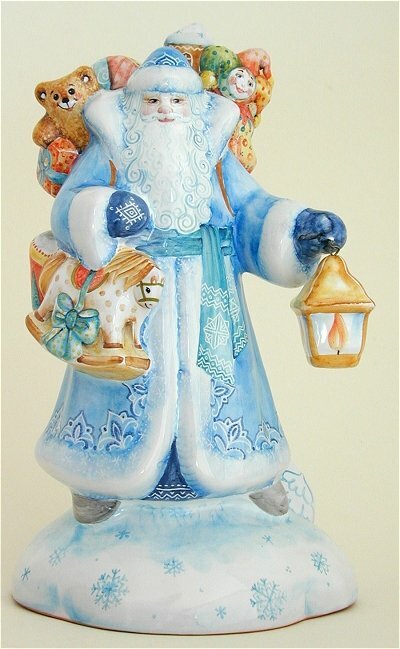 This beautiful Angel figure is @ 17 inches high and is a mixed media figure like those shown above. I am grateful to the Debreckt Studios for creating this line of pieces as they made the look I have loved for years affordable. If you bought this in a handpainted wooden masterpiece version it would cost several thousand dollars so many of you have admired it from afar. Well now you can enjoy the look in a mixed media piece with some hand painting on canvas. They are a great addition to any holiday decor. 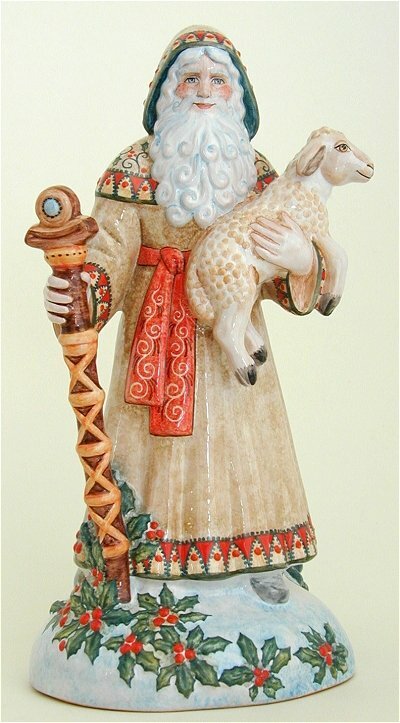 I had to give in to my longings this year and bring in these superb ceramic figures imported from Russia. 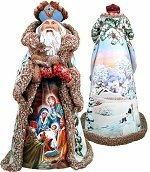 I have seen them when purchasing ornaments from the same studio but had not been moved to carry figures. This year I decided I liked them too much to pass them by again so here they are. In photographing them I realised just how nice they are with a certain feel to the painting and sculpting that comes across all the moreso as the pieces get bigger. 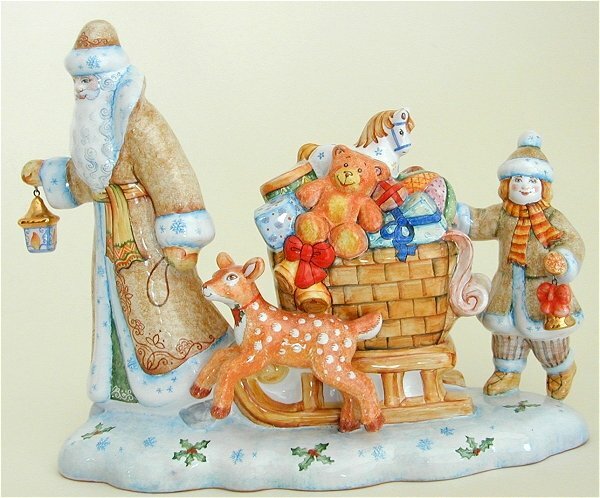 This figure is 8 1/2 inches high and is laden with a wonderful assortment of toys. It truly is the hand painting that makes these pieces so outstanding as if seen as a simple ceramic casting they have little life. The artists bring the forms alive and the result is all you see and more. Figure is 10.5 inches tall. Karen had to give me a strong nudge to get this piece on the web site as I seemed perfectly happy to have it grace our home indefinetly. If you like him as much as I do I will sell him but it's a bit like putting something up for adoption; I want to be sure he gets a good home. Completely crazy as its an inanimate object but there you go, I find him so very appealing and how do you get a lamb to look so pleased. A very merry piece indeed with a romping deer accompanying the sleigh on its rounds. Its quite large at 11 1/2 inches long and 9 inches high but it got to me safely all the way from Russia so I feel confidant that I can get it to you in the same state. This is the largest piece to date for us. He stands 17 inches high and is @ 9 inches wide. Two very cute girls are ready for Christmas with his arrival.